The exchange of Catholic wedding vows is called Сonsent – without these sacred words, the marriage won’t happen. This act, when a man and a woman give themselves to each other, is a part of every wedding ceremony. Still, a Catholic ceremony is a bit different from any other religious wedding. The words and their order for a Catholic ceremony are written down in The Order of Celebrating Matrimony. This document is a set of strict guidelines. 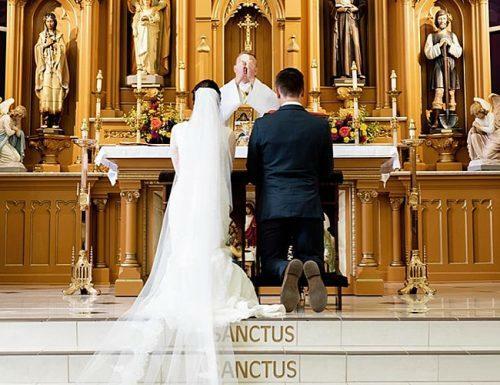 These guidelines define actions of the priest and the couple that desires to create a holy union. 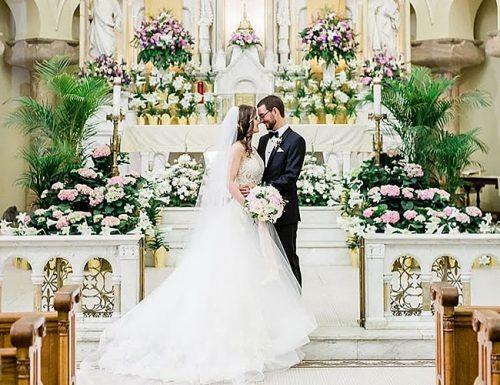 If you decide to choose a Catholic wedding ceremony, there are several things you should know. First of all, unlike other ceremonies, it has only 4 options of standard marriage vows. It is very uncommon for a Catholic priest to allow any other vows, that is not in the Order of Celebrating Matrimony. The traditional wedding vows cannot be changed or personalized, as there is no such option in the Order. So if you want to write your own wedding ceremony vows first of all check with your officiant. There is very little chance that your officiant will accept personalized vows at all, as the text of wedding promise.cannot be changed. Another option for couples who want to personalize the expression of their love is to include a personal statement in the printed wedding program. You could also raise your glasses and exchange words of love during the reception afterward. After the ceremony, the witnesses ( the best man and maid of honor) and priest or deacon sign the Marriage record in the presence of the people. The Liturgy of the Word may include two or three readings and the Responsorial Psalm. Also, at least one of readings must speak of holy matrimony. Here’s the chance for the bride and groom to make their wedding more intimate. The Liturgy of the Word has multiple options to choose from. 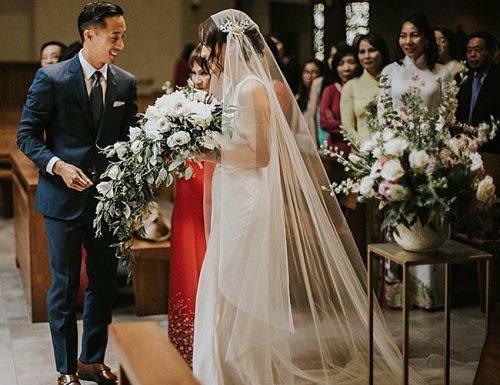 It is essential for the engaged couple to work together with the officiant (and perhaps the parish staff, as they participate in the musical selections). Although the text of the vows cannot be changed, the couple still can choose certain texts of the wedding. Such parts as the Scripture readings, the Prayers of the Faithful, musical selections etc can vary to make the wedding more personalized. As soon as the Liturgy of the Word finishes, it is time for the sacred Celebration of Matrimony itself. There are three options of wedding celebrations: celebrating within Mass, celebrating without Mass, and celebrating between a Catholic and an unbaptized person. Catholic wedding vows are the same in all of these options. The sacrament of marriage starts with the words from the priest. In his speech, the officiant requires the couple to make their declaration of consent. There are two options during the ceremony. You can memorize the words of consent, or repeat after the priest these ‘through sickness and in health’ vows. Of course, if you learn the vows by heart it will make them sound more sincere and heartfelt. Also, rehearsing them days and weeks before the big day will prepare you for this important event in your life. After all, these are probably the most extremely romantic quotes anyone can say. But if you are afraid that the stress might affect your memory, you can simply repeat the words after the officiant. In this way, you won’t forget anything and start your life together without any flaws in wording. Also, the Order for Celebrating Matrimony has another simple alternative in this case. As you see, this alternative leaves no place for mistakes: the officiant reads the words, and you only have to confirm your desire to get married. The ‘I do’ version is one of the most popular wedding vows in literature and modern culture, so there’s nothing wrong with choosing this foolproof option for your ceremony. Catholics vows from around the world may vary a bit. For example, Catholics from the United States traditionally choose ‘for richer or poorer’ vows. After the vows have been said, it’s time to exchange the rings. From this moment the spouses will wear their wedding rings as a sign of their covenant with each other and with God. The exchange starts with a wedding priest speech. As with the vows, there is no way to include wedding quotes for a couple in the Order of Celebrating Matrimony. The priest acknowledges that the bride and groom have declared their consent to be married. He prays for God’s blessing on the newlyweds, and declares, “What God has joined, let no one put asunder” (Order of Celebrating Matrimony, 64). This is the exact moment that the bride and groom become wife and husband. After these words, the marriage service is over, and it’s time for the rest of the celebration to begin. 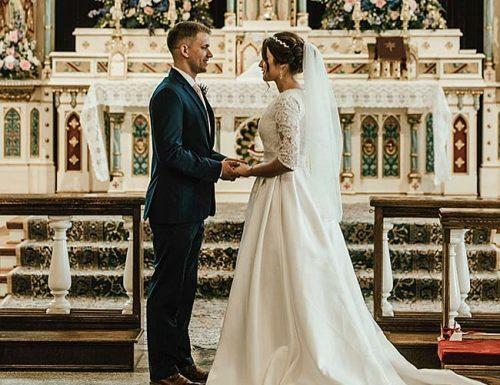 A couple might wish to have a Catholic wedding without a Mass: for example, when a Catholic marries a baptized non-Catholic Christian, or when a lot of wedding guests are not Catholic. 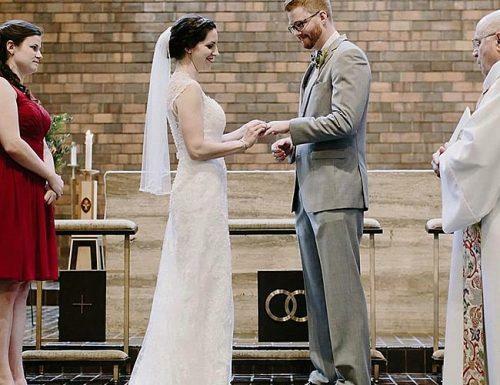 Either a priest or a deacon can use the Order of Celebrating Matrimony without Mass. This ceremony will be a valid Catholic wedding still. The main difference is that there is no Liturgy of the Eucharist. Anyway, the very heart of the marriage ritual is still the same. The Consent exchanged by the bride and groom, and the Nuptial Blessing given to the newly married couple, the Questions before the Consent, and a Blessing and Giving of Rings. There are many options to choose from. Also, various circumstances can affect the planning of a wedding ceremony. Still, the basic ceremony is the same. 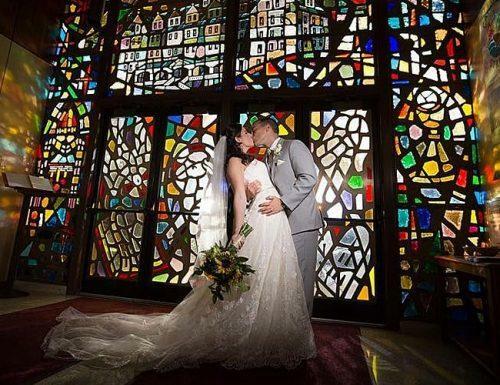 Catholic wedding vows are sacred words that unite two souls, an expression of love and trust. It doesn’t matter if you learn them by heart or repeat after the priest. After you have said the words you are joined in holy matrimony. At this moment you pledge your love before God and me, and receive God’s blessings for a lifelong union, that is open to the gift of new life.